Editor's Note: Topics Founder and chief science writer, Chaya Venkat, decided to pursue a discussion with the authors of a recent important paper on the possible use of honokiol, contained in magnolia bark extract, in CLL therapy. You may want to read our recent article on the subject - Honokiol. This compound has the potential for significant efficacy in CLL, and its use in traditional Chinese medicine suggests few adverse effects. Dr. David Frank of Harvard Medical School and Dr. Jack Arbiser of Emory School of Medicine graciously agreed to an email interview to answer some of the questions that interested Chaya. In this article we present the exchange of correspondence and an interview with Drs. Frank and Arbiser — Dr. Frank's responses are in red and Dr. Arbiser's, in blue. Please allow me to introduce myself. I am president of CLL Topics Inc., an Internet-based non-profit CLL patient education website (www.clltopics.org). We represent a large and motivated patient group, our website gets thousands of visitors every week from all over the world. We try to provide our patient-members with well documented reviews of cutting edge CLL research, clinical trial information, prognostics and therapy options. Just recently we sponsored and funded a clinical trial for CLL patients at the Mayo Clinic, Rochester MN. This trial will test efficacy of EGCG from green tea extract, it will start recruiting patients next month. I have read with interest your latest paper in Blood, on the subject of honokiol cytotoxicity in CLL cell lines. I am particularly intrigued by this small molecule’s oral bioavailability, as well as its reputed low toxicity. Caspase activation and apoptosis induction independent of p53 function is very encouraging; as you are aware CLL patients with p53 defects have few good therapy options. We will be reviewing your paper on our website. I think there are areas of mutual interest here, we would like to discuss with you ways in which we can support your research. With your permission, I would like to call you. Or you can contact me if that is more convenient. My contact information is given below. Thanks for your time. I look forward to hearing from you. How nice of both of you to write back immediately. I enjoyed our phone conversation and am very glad to have established contact with you. It must be something in the air at Dana-Farber and Emory University that makes for responsive researchers. We have just published the "Honokiol" article on our website, your paper was the centerpiece. You comments are most welcome. You can read it by clicking on the link: Honokiol. Less than 24 hours after publication of our review, I am already inundated by emails from our patient members. The consensus is that our membership is very interested in this line of research, and in doing anything we can to expedite your efforts. I have contacted our supplier in China, and the 90% purity honokiol is on its way. We expect to get it around 7th of June. We ordered one kilogram of the material, and it will be sent to you via FedEx as soon as we get it, along with the certificate of analysis and any other documentation that the manufacturer provides us. The supplier assures us that we can get more if we want it, and they are also willing to share details of their full manufacturing process with us. After you receive the product, it would be very helpful if you can verify their certificate of analysis by your own lab testing. Please consider the honokiol a small gift, no more than a token of our appreciation for your important research. Thank you as well for agreeing to do an “Internet interview” with us. We look forward to publishing this interview on our website, www.clltopics.org. I have tried to group the questions under different headings. I hope that makes it a little easier for you to respond. The intent of the interview is to educate and inform our patient community. As I said during our phone conversation, we will make sure both of you are comfortable with the content and format of the final version before we publish it on our website. At some point we would like to discuss with you the funding aspects of the human clinical trials using honokiol. We are a small non-profit organization, but just recently we have been successful in sponsoring and funding a phase I / II CLL clinical trial at the Mayo Clinic (Rochester, MN) with money that we raised through donations from our members. The drug of interest in the Mayo clinical trial is EGCG (green tea polyphenol), and patient recruitment is going to start in the next couple of weeks. In addition to funding, we are also very involved in the patient recruitment aspects of the trial. We would like to think that the high degree of patient interest, and our involvement in the funding of this trial helped convince the NCI to move forward with their approval process, as well as pitch in with some money as well. Every little bit helps. With the EGCG project underway, we are looking for suitable candidates for our next project. Let us know when the honokiol animal studies are well enough underway and a clear path exists to initiating human trials. I think this has many of the criteria that would be of interest to our membership. Thanks again for taking the time to do this interview. We look forward to working with both of you. A large number of plant derived compounds have been suggested as potential chemotherapy agents. What made you decide to investigate the cytotoxic effects of honokiol? What makes this drug of particular interest in treating CLL patients? The finding that honokiol can overcome the resistance to cell death (apoptosis) was a particularly important finding. A great deal of evidence suggests that CLL cells show a fundamental defect in undergoing apoptosis, a process that is part of the normal life cycle of a B lymphocyte. The ability of honokiol to overcome this raised the possibility that either by itself or in conjunction with standard therapies, this compound might be particularly useful in CLL. A recent paper from Dana Farber reported on the efficacy of an unknown Chinese herbal formula in treating a single CLL patient. Since magnolia bark is frequently cited in traditional Chinese medicines for treating cancer, do you think it likely this unknown formula contained honokiol or magnolol? It is impossible to know. Dr Frank is trying to locate the original supplier of this compound. We have not been able to identify the material in the original herbal preparation taken by the patient about whom we reported. We have found the herbal practitioner, and we are trying to determine whether magnolia extracts are part of his regimen. However, this experience has revealed some of the difficulties in understanding these therapies. The preparations are often quite heterogeneous, and it may be difficult to separate potentially useful components from neutral or potentially harmful material. I know of several CLL patients who have seen this same herbal practitioner, and none has shown a significant beneficial response. Extracts from magnolia bark typically have both honokiol and magnolol. Do you plan to use this "natural" mixture of the two compounds in your future in-vivo testing, or do you plan to use pure synthetic analogs of the naturally occurring compound(s)? We understand that the next step in the development of honokiol is to test its efficacy and toxicity in-vivo, using large mammals such as dogs and monkeys, and if the results continue to be promising in these tests, phase 1 dose escalation clinical trials may start with CLL patients. Do you have a time frame when such clinical trials are likely to initiate? Will the clinical trials be conducted at Dana Farber? I think the Dana Farber would be the ideal place to initiate trials. Emory University (Winship Cancer Institute) would also be one of the initial sites. Although we are not ready as of yet to bring honokiol into clinical trials, Dana-Farber is enthusiastic about introducing innovative new treatments into clinical trials for CLL. We have a strong interest in both the clinical and scientific aspects of this disease. We feel that by combining this expertise we have the best chance to learn as much as we can about CLL, and to determine the optimal ways to treat it. Given that magnolia bark extract has been used in the practice of traditional medicine in China and Japan and that a history of safety and tolerability exists, do you think human clinical trials may be possible on an accelerated basis? The FDA will require toxicity and pharmacokinetic studies in animals for any natural or synthetic properties. We are highly motivated to perform these studies, and they are our highest priority. Does the NCI have an interest in developing these molecules as therapeutic agents for CLL? Will they have to examine and certify the material before it is used in a human clinical trial? We are pleased to be able to locate and procure a high grade and high concentration of honokiol + magnolol (>90%) for use in your lab work and in large animal studies. Please consider this a gift from the members of CLL Topics. Would you be testing this material for the purpose of verification of the supplier's certificate of analysis? Would you be willing to share the results of this testing with us? I am grateful for this gift, and would be happy to share the results of testing. Do you have a GMP (Good Manufacturing Practice) certified manufacturing source that can supply the required grade honokiol / magnolol for the human clinical trials? Can we be of help in getting you adequate material from our supplier in China? We have not yet located a GMP manufacturer, but would be interested in anyone with suggestions. 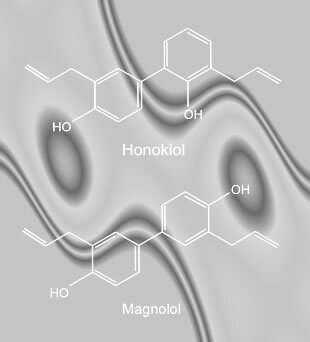 Some of the earlier work with honokiol in other cancers (both cell line and in-vivo mouse studies) has suggested that the cytotoxicity of honokiol / magnolol is independent of p53 function, and therefore even CLL patients with poor prognostic chromosomal aberrations may nevertheless respond to these low toxicity compounds. Is this your understanding as well? Our work on CLL cells in the laboratory has indicated that honokiol can lower the threshold for cell death independent of the classic prognostic indicators. Thus, we are hopeful that this compound may be useful across the spectrum of patients with CLL. One of the problems with monoclonal antibodies such as Rituxan and Campath is their inability to deal with bulky disease. Since honokiol / magnolol are small molecules, do you expect better bioavailability, better access of the drug to large lymph nodes? Bulky disease can be difficult in all forms of cancer, because the blood supply and architecture of these areas may be less favorable for cell killing. However, this is why clinical trials are critical, as they can allow us to address these questions in a careful and comprehensive way. Traditional medicine practices suggest honokiol / magnolol have good oral bioavailability. Is it your intent to test these drugs as orally taken capsules, or do you plan to use intravenous infusions or sub-cutaneous injections? We initially will look at IV infusion, but if pharmacokinetic studies demonstrate that the drug is highly available, we would certainly be interested in oral formulation. In your opinion, is the role of honokiol / magnolol likely to be as cytostatic drugs, used to maintain remissions obtained by other agents, or do you see them as cytotoxic drugs either by themselves or in combination with other drugs? Honokiol has cytotoxic activity by itself, but optimally I think honokiol would potentiate other standard therapies for CLL, such as fludarabine/cladribine, as demonstrated the recent Blood paper. There have been indications that honokiol / magnolol may have synergistic effects with other low toxicity drugs such as Vitamin D3, ATRA (all trans retinoic acid), Fenretinide. Do you plan to test some of these combinations for synergy in your cell line studies? These studies are currently underway. Since honokiol / magnolol appear to lack a commercial pharmaceutical developer to promote it, will funding be a problem in launching clinical trials? There are mentors who are helping me perform the studies necessary to bring honokiol to clinical trial. How can our patient organization help you move this research forward? Based on feedback from our members, there is very strong interest in supporting this research, and we are willing to explore all partnership options with you. Organizations such as yours are a critically important component of improving patient care. The education component alone – letting patients know what options are available, and what new work is being done, is hugely important. In the end, clinical trials in patients are the way that medicine in general, and oncology in particular, move forward. The more that patients know about this, and can make informed judgments about their own health and their participation in clinical trials, the more we all will benefit. I think that your organization can help in several ways. First, patient advocacy groups have power that scientists do not, and can help focus Congress, NIH, and NCI in ways that we cannot. Secondly, when we start clinical trials, we will ask for help with recruitment. Finally, anyone who has connections with GMP manufacturers is welcome to contact me. As you know, there is a great deal of interest on the part of cancer patients in using "alternative", "natural" or "traditional" therapies, sometimes without medical supervision. Magnolia bark extract is available from several sources, and is not regulated as a drug. What is your advice to patients considering using the material themselves? While we know about the drug's activity in mice, human use of an unapproved substance is problematic. While preparations of honokiol may be commercially available, I cannot vouch for their purity, nor for the presence of other toxic chemicals or bacteria in the preparations that may cause immediate harm to CLL patients. Also, given that we don’t know whether honokiol is effective in CLL patients, nor what dosage to use, I cannot recommend honokiol over standard regimens for CLL. Until more information on honokiol is obtained, I cannot recommend it for CLL, and I would not want patients to refuse current therapies in favor of unknown honokiol preparations. Honokiol and its structural isomer magnolol are known to have anxiolytic effects, similar to diazepam ("Valium"). However it has been suggested that unlike diazepam, honokiol / magnolol are not likely to cause psychological dependence, motor dysfunction and sedation. Would you comment on this aspect of the daily or long term use of these compounds? I don’t know enough to comment on this. Our laboratory has a longstanding interest in CLL. Our focus is on understanding the molecular defects that distinguish a CLL cell from a normal cell, and harnessing these differences to develop new targeted therapies. As an oncologist, I also know that many advances have been made by taking observations made in patients, and bringing them back to the laboratory. Thus, based on my care of patients with CLL we have developed an interest in how natural products (such as the herbal extracts mentioned above) may benefit our patients. In the end, we want to use any approach possible to bring forward new, innovative, more effective and less toxic therapies for our patients.